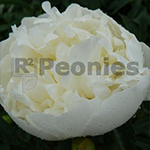 Duchesse de Nemours is a very strong Peony with dark foliage and beautiful full double flowers. The buds come with green and pure white. There is nothing else so beautiful as a bucket of Duchesse right now. This variety does need some staking. The fragrant flowers bloom in the midseason. Duchesse de Nemours is ideal for cut flower business. To order Peonies just for wholesale, contact one of us for information. This information has been compiled with the utmost care. The offer is without any obligation. At the content of this text can no rights or claims be made in any way whatsoever. © 2017 R2 Flowers BV. All rights reserved.